Indigo Arts exhibits work by some of Nigeria’s leading contemporary artists of the last forty years, including the late master of the aluminum relief, Asiru Olatunde, and his family and students, including the late Yekini Folorunso. Most recently, we are pleased to offer the work of Asiru's grandsons, Toyin and Ishola Folorunso. 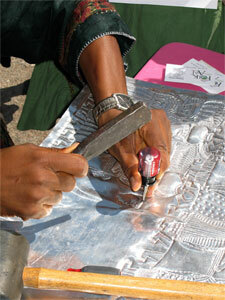 Aluminum-relief artist Toyin Folorunso demonstrates his art in Santa Fe. July, 2007 (photo by A H Fisher).